The weather had changed overnight with a cold front coming through, bringing heavy overcast and a small chance of showers or thunderstorms during the day. Most of the day was windy and cold, keeping me dressed in a fleece and sometimes my balaclava. It never did rain, which was good, since I was driving about 20mi all on dirt roads - a sudden thunderstorm could have made a mess of things. Today's peaks were all around Fairview Valley, a large, sparsely populated desert valley found northeast of Apple Valley in the Mojave. I had been to the area on previous occasions, tackling the highest summits, those with more than 900ft of prominence. Today was a mopping up effort so to speak, collecting the remaining summits. All of them are officially unnamed, but three had Smatko registers from the 1970s, and the names used here were taken from these registers. This was the southernmost of the summits, overlooking both Fairview and Lucerne Valleys. I was able to drive on decent dirt roads to the very southeast tip of Fairview Valley, parking about 2/3mi west of the summit. A steep initial climb was followed by an easier gradient for most of the distance. The grass was tall and the slopes quite green, with purple flowers in abundance on many of today's peaks. Andy smatko and girlfried Evelyn had left a register here in 1979, dubbing it "Evand Mtn", a combination of their first names. Jeff Moffat had been the only other visitor to sign it, 38yrs later. 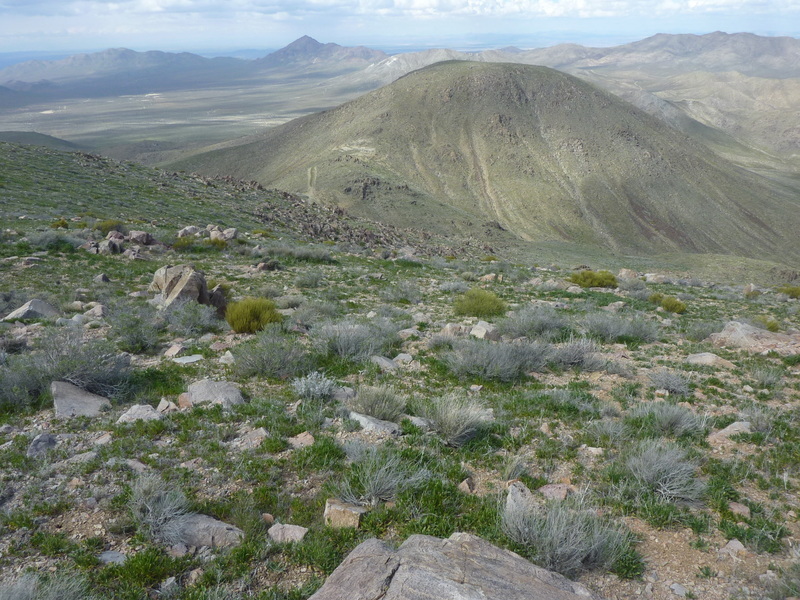 Two miles to the north of Evand Mtn is the higher and more prominent Peak 4,813ft. I repositioned the jeep to the north with a bit of circuitous driving to get me within a mile of the summit on its southwest side. I drove by some of the scattered homesteads in the valley on my way. A few of them are kept in tidy condition, but most were of the more neglected variety that appears commonly in desert communities. It took about 40min to make my way up the moderate gradient, this one not rolling off until nearly at the summit. Good views overlooking Fairview Valley and a pretty nice one of snowy Mt. Baldy to the southwest across the expanse of Apple Valley. I next drove north through Fairview Valley, the last resident seen just before reaching the dry lake. There was a fine carpet of purple flowers covering most of the lakebed as I drove through on the BLM road heading north. I connected up with Johnson Road and took that several miles east up the narrowing valley between these two summits. I tackled the easier Peak 4,379ft first, driving to within a quarter mile on the north side. It took all of 11min to reach the top, even faster on the descent. The peak is composed of large granite boulders, not quite class 3. Back at the jeep I moved it a short distance to the base of Doubknob Mtn, about a mile from the summit. The hike up from the southwest was longer than the previous ones, the summit area a jumble of granite boulders, with an easy class 3 summit block offering several ways to climb it. Smatko's register dated to 1978, a solo outing this time. The naming seems odd for Smatko, a shortened version of "Double Knob" perhaps, but the summit has three closely-spaced summit blocks, so who knows. The register was surprisingly busy, some four pages of entries all told. Again, Jeff Moffat had been the last to sign it, this time in 2018. The last three summits, located to the northwest as subsidiary summits of Sidewinder Mtn, were done in a single outing. Oddly, there is a very straight road running north-south along the border between township sections 15 & 16 (see the topo map if you care about such trivialities) that can be used to get several hundred feet above the valley floor. The road is pretty rough and seems to get little use. At the end of the road, one branch turns northeast to climb a few hundred feet more to an old mine. Another fork branches hard left, again following the section boundary as the road drops to a gully. I parked where the original road forks and then started off on foot down the road to the west. At the gully, I left the road to continue more directly up to Peak 4,237ft, my first stop. This minor summit overlooks the massive cement plant that has engulfed much of Black Mtn to the west. The noise coming from the plant is significant, a mix of large trucks, trains and massive machinery, with gray dust covering everything inside the quarry - a somewhat dystopian-looking blight on the landscape. Peak 4,237ft sits at the southwest end of the ridge forming Sidewinder Mtn and my next summit was another 900ft higher along the ridge to the northeast. This was a pleasant hike with only one short steep section, most of it easy walking. It was after 2p by the time I reached the higher Peak 5,125ft. Smatko had left a register here in 1976, dubbing it Westwinder Mtn (the name obviously derived from the higher Sidewinder Mtn, which lies another 2mi to the southeast along the same ridge. Interestingly, Andy paid the summit a visit on five subsequent occasions, the last in 1992 - seems this was one of his favorites, as it's rare to see his name even a second time in a register. The last summit, Peak 4,874ft, was another 3/4mi to the northwest, connected by a saddle dropping 600ft from Westwinder's summit. I made a descending traverse to save some extra distance in retracing my steps west along the ridge, though I'm not sure I saved any time given the rough nature of the terrain I crossed. An old road is encountered at the saddle, no longer used - it appears to come up from the west and the cement plant property. A short but steep climb leads up the South Ridge to the summit of Peak 4,874ft. There is an old, defunct antenna installation still standing near the summit. A bulldozer has recently (in the past few years, anyway) run a track across the summit, though I couldn't figure to what purpose. If there was ever a summit rock or register, they look have been plowed under a layer of loose earth - oh well.